Fresh out of college, I landed my first “big-girl” job at a Texas design firm. My emotions were at an all-time high and I was ready to give it my all. I left everything I knew behind and moved from Michigan to Texas. I was excited for the adventure, but unfortunately, the job wasn’t what I expected. Instead of being everything I dreamt of, it was a less-than-glowing experience. In hindsight, I realize the company’s values did not align with mine. My design team was rarely on the same page and we frequently had to redo work. This was partly because there was nothing uniting us as a company. Sure, we had fun every now and then, but it was a challenge to produce great results when my team couldn’t collaborate. 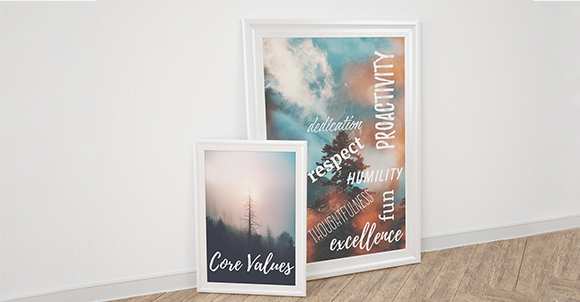 At the design firm, the term “core values” meant nothing to me. I didn’t know what core values were and I don’t think my employer did either. In my current role with JB Ashtin, it’s a completely different story. Our core values are ingrained in us. They’re not just words painted on a wall—they are our DNA. Our core values guide how we hire staff, manage business situations, and make decisions. I realize our values help cultivate a more collaborative work environment and better serve our clients. By living our core values—excellence, proactivity, dedication, respect, thoughtfulness, humility, and fun—we create positive results for our clients. Put Your Seatbacks in the Upright Position: Proactivity and dedication in action. In the winter of 2017, we partnered with a client to execute an advisory board meeting in Florida. All attendees—many from the Northeast—were excited to escape the cold. Flights and hotel rooms were booked, but the morning of attendee arrival day, one of our project coordinators woke up to a travel alert: flights were being cancelled due to a huge winter storm. Car service to a different airport with a single remaining seat? Check. Rearrange multiple legs of a journey to get attendees out of the storm zone? Check. Because of our coordinator’s proactive decisions and dedicated efforts, every attendee made it to the meeting. The client was extremely grateful, and the meeting was a success. JB Ashtin vs Predatory Journal: Excellence and thoughtfulness in action. A client recently reached out to us because they were excited to publish their work in a new journal. Over the course of 2 days, the client was contacted twice by publishers who were interested in publishing the client’s data. The client was excited by the opportunity to publish quickly, but our scientific writer thought something was fishy. Our writer quickly researched the request and confirmed their suspicions: these journals were predatory journals not indexed in PubMed, MEDLINE, or EmBase. A senior staff member responded to the client—discussing predatory journals and why it was in the client’s best interest to ignore the invitation to publish. Thanks to our writer’s excellence and thoughtfulness, we protected the client from the predatory journal without wasting any resources. The client was very appreciative and passed the information onto her peers. Got Oil? : Thoughtfulness in action. It was a regular night in speaker bureau world with several dinner meetings planned. Three hours before one of the dinners, a speaker called to cancel. Our team quickly reached out to all speakers within a few hours’ drive and found a replacement. As the replacement speaker was driving to the dinner, her oil light came on. The speaker called our on-call coordinator who determined the speaker could safely make it to the venue. In the meantime, the coordinator called nearby auto mechanics and after finding none available, the coordinator called an automotive store and had oil on hold. The client’s regional director was looped in, who offered to pick up the oil and agreed to change the oil in the venue parking lot! Our coordinator’s thoughtfulness and the regional director’s humility, helped the meeting proceed as scheduled. The speaker got her oil changed and the client received a glowing email the next morning. Unlike my first position with the design firm, our core values at JB Ashtin are integrated into everything we do without even thinking about them. That’s because we hire talented individuals who share our values. These values unify our team, cultivate a better work environment, and ultimately, better serve our clients. If you want to work with a devoted partner that will do whatever it takes to help you succeed, contact us to learn more. We will even tell you if we’re not the right partner for you. JB Ashtin is a full service medical communications company that puts our clients first. Our can-do attitude comes standard.